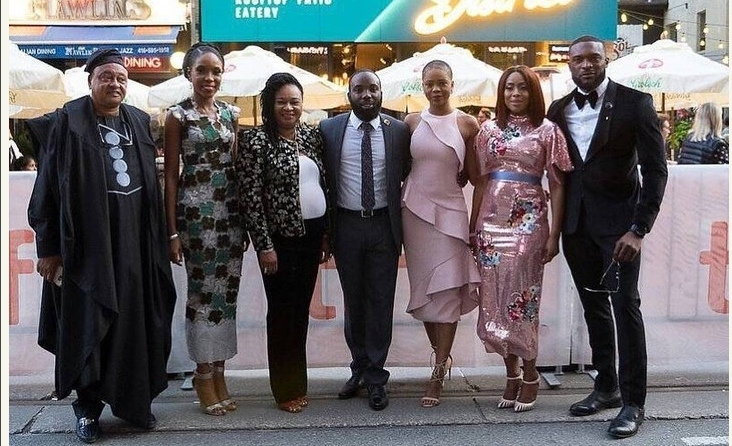 The cast and crew of ‘The Royal Hibiscus Hotel’ took Toronto’s iconic Festival Street by storm last night for the World Premiere of EbonyLife Films ‘The Royal Hibiscus Hotel’. Zainab Balogun, Kenneth Okolie, Kemi ‘Lala’ Akindoju, Jide Kosoko, Rachel Oniga and Toni Tones brought pomp and pageantry to one of the world’s most famous Film Festivals. Directed by Kaduna-born director Ishaya Bako, The Royal Hibiscus Hotel is the story of Ope – a disillusioned chef working in London who returns to the family business she’s destined to inherit in Nigeria. She soon meets and falls in love with Deji a charming, successful entrepreneur whose secret plan could jeopardize not just their budding romance but the future of the Royal Hibiscus Hotel. The Special Guest of Honour for the premiere was Mr Foli Coker, DG – Nigerian Development Tourism Commission. The sold out premiere had some of Toronto’s well known celebrities and influencers in attendance including Toronto Raptors’ General Manager, Masai Ujiri.